You know what it is and you want to try it, but all you can muster are those New Year Resolutions that roll around every year. They start off great – you write down all the things you want to accomplish this year. But, before you know it – it’s three months later and you’ve done nothing on that list. Goal setting is more than jotting them down and hoping they flourish. It’s a mindset change as well as an action driver. I’ve used goal setting as a freelance writer and blogger and I know for a fact it has helped me make more money. 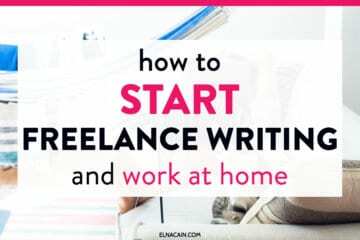 And it can help you land more freelance writing jobs too. If you’re completely new to setting goals for your business, let’s walk though this process and then I’ll help you form your goals, give you inspiration and share the best tool to help you stick with those goals. I get emails from new writers every day about how doubt cripples them so much that they don’t take a chance or take action. They don’t invest in themselves. To be successful with goal setting you have to know that you WILL accomplish these goals and that these goals WILL help you be more successful than if you never created these goals in the first place. So, these goals can help diminish any doubt you may have. My initial goals for freelance writing were income-specific. 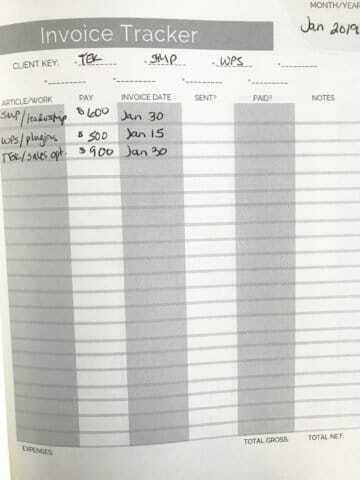 I wanted to land at least one client in a certain time frame and generate $1,000 from writing by a certain month. I exceeded my goals by weeks and even months. I strongly feel that sitting down and writing out my goals helped me visualize the end result and motivate me to work on them each day. So, give yourself permission to create goals for freelance writing! In my course, Write Your Way to Your First $1k, I have an entire lesson on creating S.M.A.R.T goals. Specific –Your goal is specific, meaning it’s about one thing and it’s not vague. A vague goal might be: To earn any money as a freelance writer. A specific goal is: To earn an extra $500/month as a freelance writer. We can add more to the specific goal as this is the first step in creating a S.M.A.R.T goal. Measurable – It’s important you know how to measure your goal. Having a goal like: improve my writing has no way to measure this. Writing is subjective, right? So having a goal like: Increase my writing to over 100wpm is measurable. Achievable – Is this goal achievable or did you write out a stretch goal that is too huge to accomplish? It’s okay to have a stretch goal – make a living as a writer. But for S.M.A.R.T goals you want to narrow down your focus and make them achievable for you. Setting up steps is a way to make your goals more achievable. Results-oriented – Again, your goals must have a result at the end. What are going to have at the end of this? More income? Faster typing? More clients? Time-sensitive – Finally, putting a deadline on your goals increases the likelihood you will achieve them. As a new freelance writer, it’s a good idea to create 3-5 S.M.A.R.T goals. It’s okay to create more general goals, but don’t avoid using S.M.A.R.T goals to measure your success. It’s realistic – Thinking you can quit your job and land a freelance writing gig in 3 weeks isn’t realistic. Many people go to Google searching for ways to make money not realizing that freelance writing isn’t a get rich quick strategy. This is a REAL business that you need to invest in and nurture. They are ordered – Since you’re making about 5 goals, prioritize them from most important to least. Maybe creating samples is the most important goal you have. Work on that first. Accountability – I know that goal setting is personal, but you will accomplish your goals if you are accountable to them. And you can do this by publicly sharing your goals. You can tell your friends, other writers, or go on social media. You can email me your goals! I asked my list last week what their #1 goal is for this year. I received some awesome goals! I received a ton more goals from my subscribers, and I apologize if I didn’t mention them here! I like to write things down and I can bet that you do to! 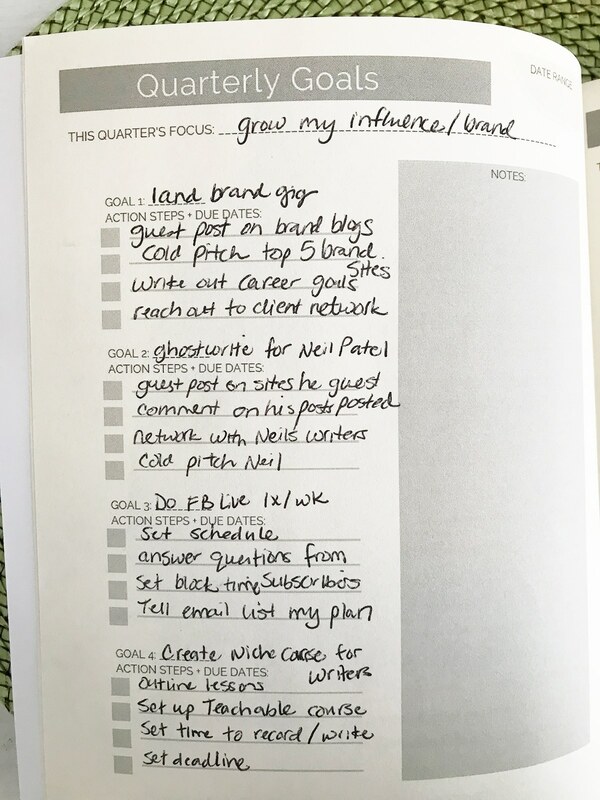 But, when I first started I had about 10 notebooks with notes for various clients, pitches, and tracking what I was earning – it was haphazard and terrible! I had to create a project management system first to keep track of what I was doing. This was great for the first year or two, but I slowly grew out of that. I needed more than just that system. 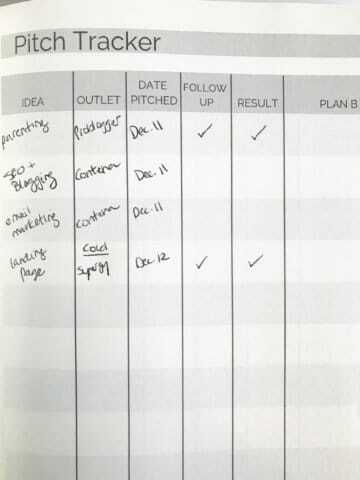 I wanted to track my pitches and goals as well as my weekly to-do list. But all the bullet journals and planners out there weren’t specific to my freelance writing business. 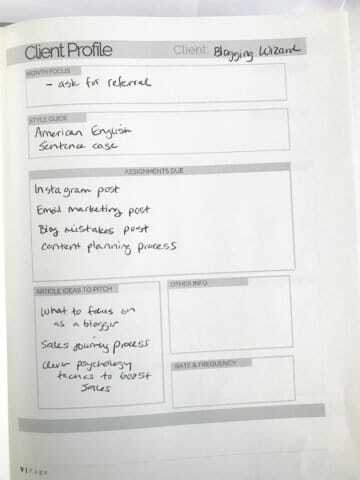 Luckily, a fellow freelance writer, Ashley created a productivity planner just for us – the freelance writer! In Ashley’s planner she starts with having you set your quarterly goals. I like this approach and started using this approach this YEAR! I feel doing this breaks down your goals and makes them much more achievable. It also gives you a loose deadline too. The next section of the Productivity Planner is the Client Profile pages. You can map out all your clients’ information in one place. As a new freelance writer, pitching will be a huge part of your strategy to land clients. 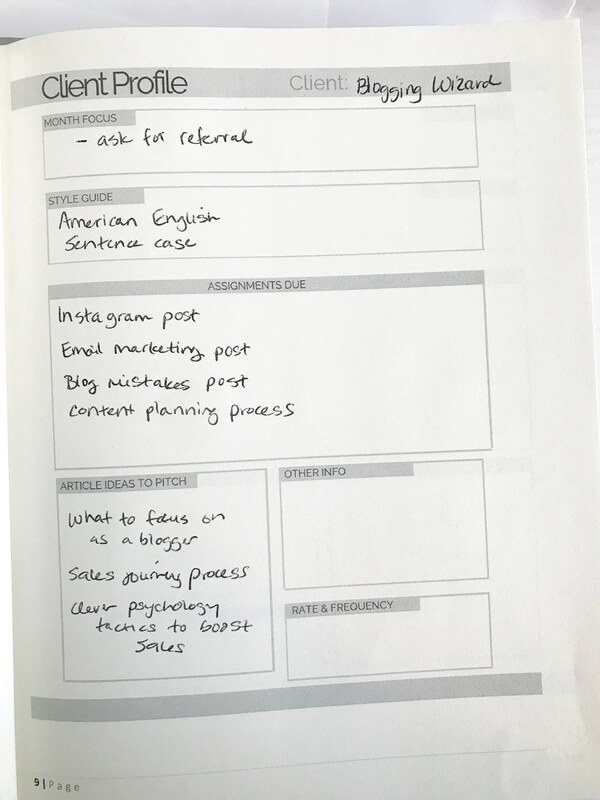 I like how this Productivity Planner has a section to keep track of all the pitches you do. 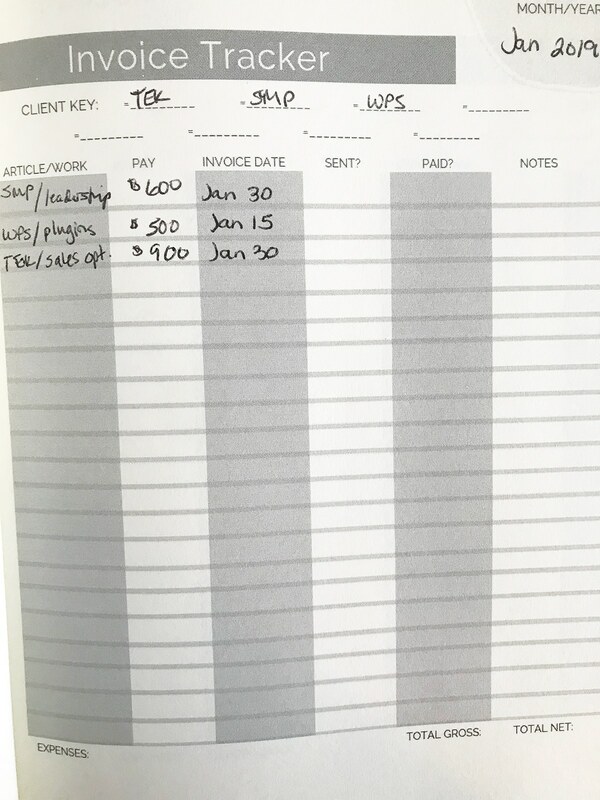 You may also want to use a project management system as well as the Invoice Tracker pages in this planner. You want to ensure you get paid, right? 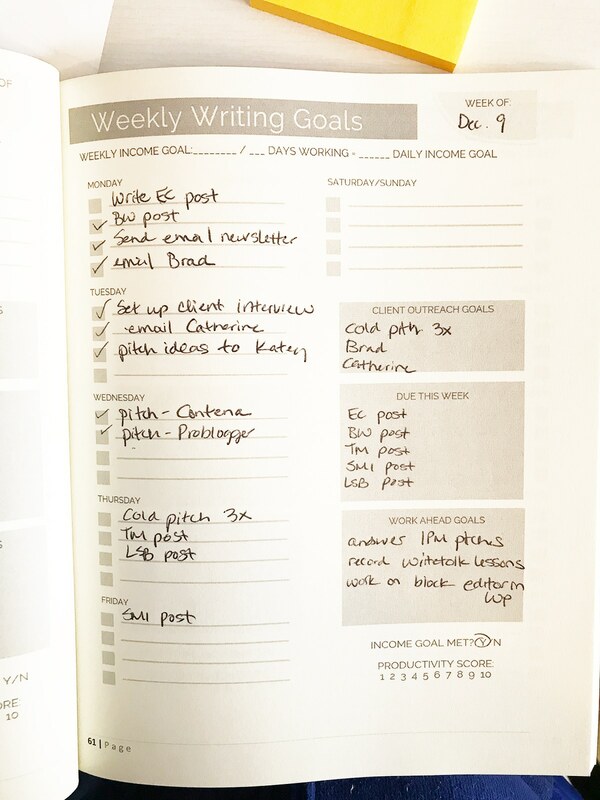 I started to track my weekly writing goals and I incorporated all my blogs and client pieces. 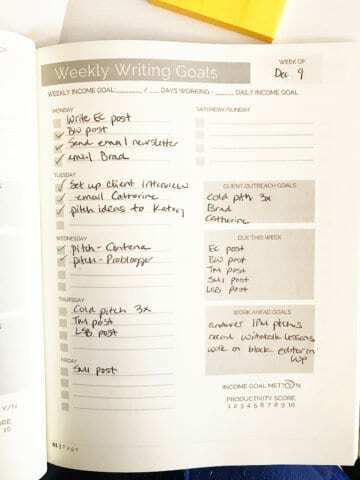 What’s cool about this specific planner is that you can track your productivity score each week and your income goal each week. 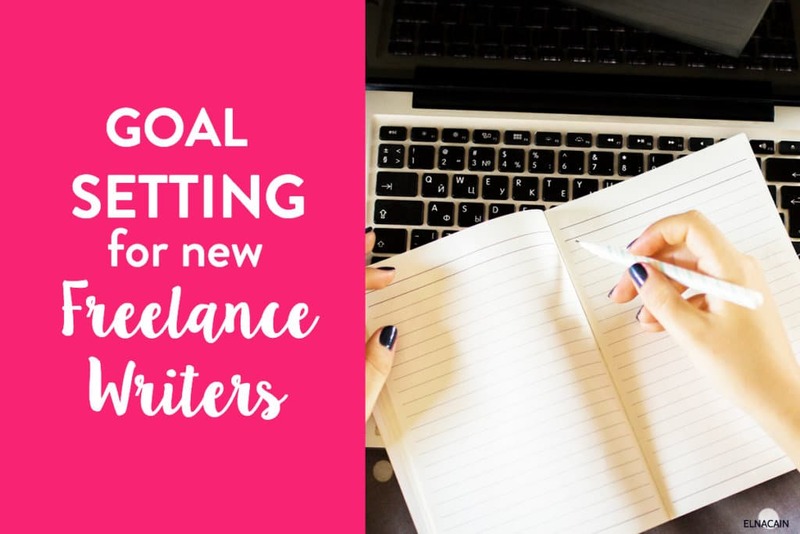 Goal setting is important to establish early on in your freelance writing business. We are doing this alone and there is no boss or job telling us when to wake up, when to work, when to take a break, when to write or when to pitch. It’s up to us to figure out our writing routine and work towards each goal we set out to do. Over to you – what are your goals for this year? Share with me your top goal or top three goals! I’d love to support you! And, don’t forget to check out Ashley’s Productivity Planner! Great post, Elna! 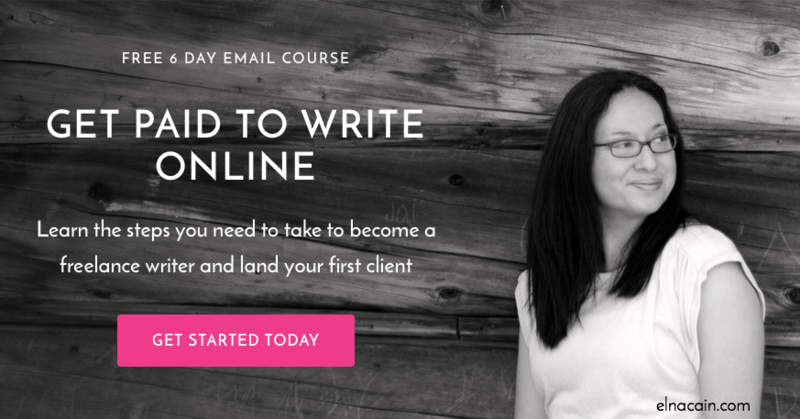 I’m going through your Write Your Way to Your First 1K course and loving it! As somone just getting started this is just the advice I was looking for. The link for the productivity planner will not work for me though. Where can I go to purchase it? The link is an Amazon link so maybe search for it there! I ordered mine this week. I’m so excited to get it. I have needed something more customized to my freelancing work. Thank you for sharing this resource. 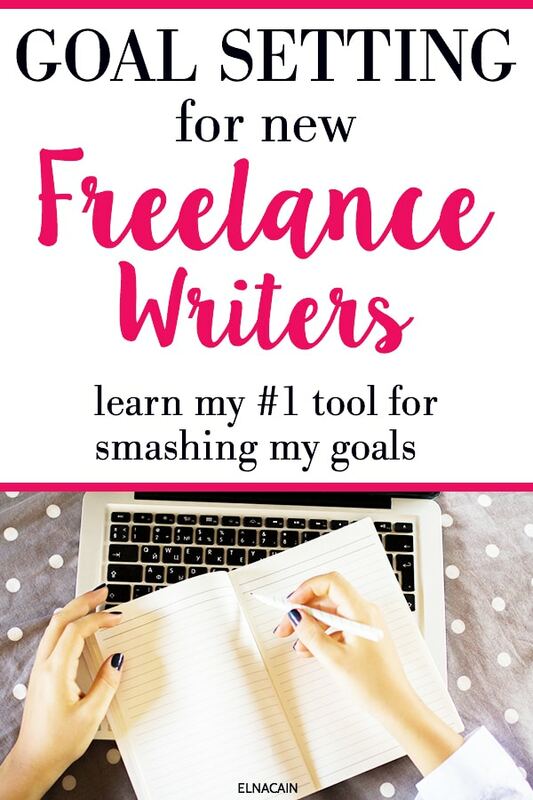 Wow and thanks for ordering the productivity planner for freelance writers! I absolutely love it! I hope you enjoy it! 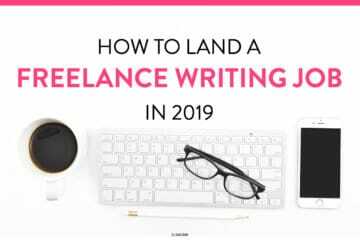 I am just starting my journey as a freelance writer .Your website serves the purpose and I am so happy to find such informative article. Goal setting is important and more important is getting the first client to showcase your writing as it is always a daunting task . 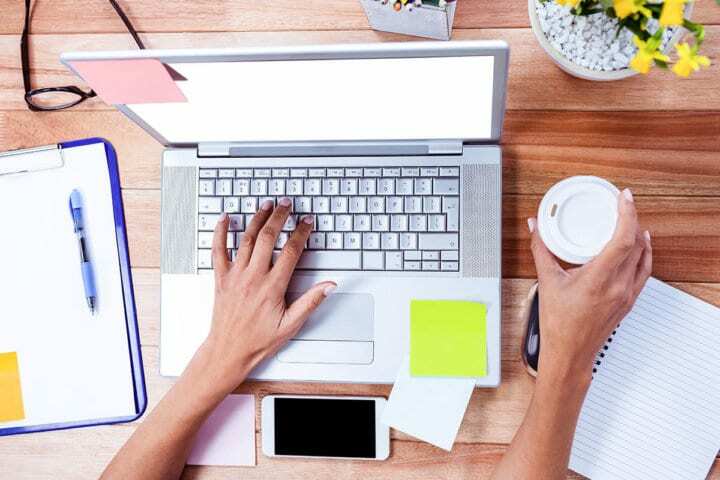 It is not easy to leave 9-5 pm job and start as freelance writer. So proper vision and action need to be done simultaneously to get good results while setting the goals. Thanks for the article. Thanks so much! Yes, goal setting is key to really make more money as a freelance writer. You hold yourself accountable and you strive for the best. I love setting goals, but for me it’s keeping them. That’s why I love this planner I featured as it’s helping me KEEP my goals! Hey Elna! Great post, thanks for sharing! 🙂 While I do think goal setting is super important to give you a general direction – I think a lot of people struggle with it because they don’t see the exact path that will lead them to achieve that goal. 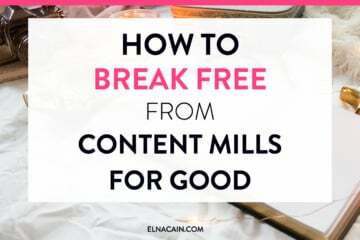 Sometimes, especially when you try to do something radically different from what you’ve done before, even breaking down a big new goal isn’t really helping that much – as you have no idea which steps you should take. I’d still argue in favor of setting a big goal, even though you have no idea how to get there. Quite often you’ll figure it out on your way! I see your point and it does make sense. If you don’t know what the mini steps are to a bigger goals, how can you break it down? In that case, creating big goals is your start and hopefully from researching and following through, you figure out the little things that need to be done to accomplish that big goal! Thanks for stopping by! <3 Thanks so much! You will LOVE this planner. I do and I use it every day! Thank you for these tips as well as Ashley’s productivity planner. I did a post on my blog about SMART goals also and found it interesting that there are many ideas about who actually developed this method. I have been looking at many planners and the ones I’ve found are just too general. This may just what I was looking for. Thanks for sharing! You’re welcome! 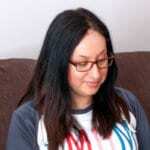 So glad you found this post about goal setting helpful for your freelance business. I hope you enjoy Ashley’s Productivity Planner. It is just for us freelance writers and I feel that makes it special and better than any other planner out there. Great tips for goal setting. Thank you, Elna! I think I’ll have to grab that planner. It looks amazing! You’re welcome and thank you for grabbing the planner! It really is a great planner and I’m loving it! I love all your images! You are going to rock your goals this year! Thanks mama! 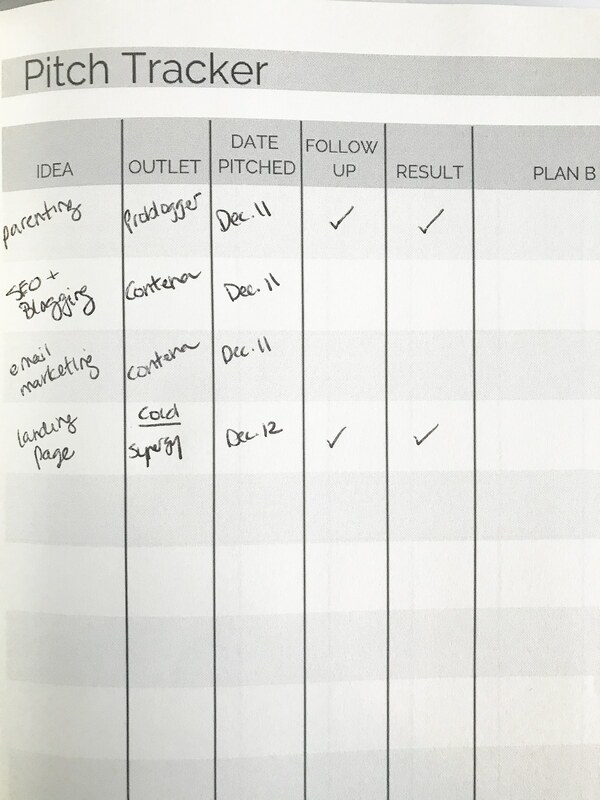 Glad you enjoyed this post about goal setting 🙂 And loving YOUR planner mama! Hi Elna, thank you so much for including me in the list. Seeing it there definitely makes me accountable for it. Your point on prioritization had me smiling. Because when I started off, there were (still are) about a million things I wanted to do and needed to do. But there just isn’t enough time in a day. Focusing on one or two things first really helps. I just check things off as I go along. I’m good as long as there is progress. Congratulations on hitting 100 000 pageviews! I had just hit 1000 pageviews after 22 days of blogging. It’s a tiny tiny milestone but I’m excited. I hope it’ll be a great year for everyone! You’re welcome! I’m glad this post is pushing you to accomplish your goals. I’m glad you are focussing on only one or two things to help you be more successful in goal setting! Thanks so much! I’m excited that I hit 100,000 pageviews! This is a blogging goal I have never accomplished until now!